Posted on July 5, 2017 at 11:38 pm. Nevada casinos are being warned to keep marijuana off their floors after the substance became legal over the weekend. As the World Series of Poker (WSOP) $888 Crazy Eights No-Limit Hold’em 8-Handed event commenced on July 1 at the Rio All-Suite Hotel and Casino in Las Vegas, buying marijuana in the state became legal. Shops all around Nevada opened on Saturday and more than 100 people lined up at one Las Vegas-area marijuana dispensary. But casinos have been warned by the Nevada Gaming Commission (NGC) to keep the substance off their floors or risk their gambling license. People looking to buy marijuana can purchase it all over the state, except the Las Vegas strip, and can only use it at a private residence. The NGC has extended this legislative clause to include hotel rooms. Since the federal government still classes marijuana as a Schedule 1 drug, it considered an illegal substance at a nationwide level. This makes it incredibly difficult for regulators and licensees since the state laws differ from the federal laws. But it seems regulators have directed casinos to abide by federal legislation instead. When it comes to the casino and marijuana business, Dr Alamo said that “you cannot do both”. Regardless, it is still illegal to use Mary Jane in public places including on US property such as national parks and federally subsidised housing. Additionally, only people aged 21 and over with identification can buy up to one ounce of weed or one-eighth of an ounce of edibles or concentrates. Anyone caught indulging in public will get a $600 fine for a first offence. 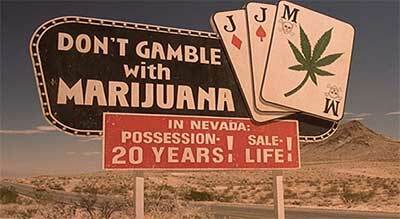 Nevertheless, casino and WSOP players can legally go to marijuana-friendly condos just off the Las Vegas Strip which allow pot smoking – cigarettes are banned – before hitting the casino floor or poker room. There is also a “Cannabus” tour which offers tourists and locals a look inside dispensaries and a grow facility. Passengers also receive a goodie bag with rolling papers and other gifts. What’s next for Mary Jane in Vegas? Earlier this year, legislation attempting to allow marijuana to be consumed in clubs and other public places failed. But it will reportedly be revisited next year or the year after. Such an attitude could mean WSOP players could be calming their nerves at the poker tables by 2019.